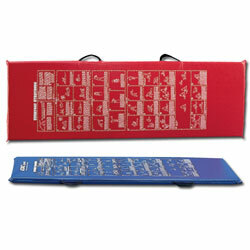 An individual exercise mat with a Bob Anderson stretching program imprinted upon the cover material. Filled with 2" thick foam. Size 72"L x 24"W x 2" thick. This mat folds into three sections for easy handling and storage. Size 72"L x 24"W x 2" thick. 8 lbs. 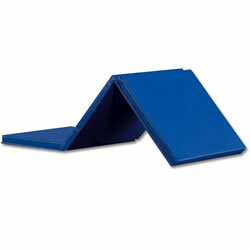 Features: Mat folds into three sections for easy handling and storage. 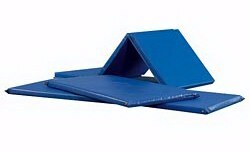 Durable, light weight mats that are easily stored. A Unique, Versatile, Folding Mat! On one side a 4” wide stripe is silk-screened down the middle to simulate a balance beam. 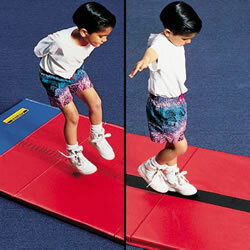 The other side, which can be used for practicing standing long jumps, has a 3’ x 12” blue takeoff area and is marked in feet and inches to 10’ 9”. Either side may be used as a standard tumbling mat. Filled with 1- 3/8” cross-link foam and covered in heavy-duty vinyl. 12'L x 3'W. Meets California Fire Marshall specifications for flammability. Red only. Features: For a wide variety of activities. For balance beam or long jump.